I saw this concert while I was living in Bloomington as a student. It was extraordinary experience, inasmuch as I got myself in a VERY ALTERED state of consciousness prior to the concert. The kind of state that lasts 8-10 hours, if you know what I mean. It's the only concert that I ever attended in that state, and merely walking from McNutt was an adventure. The round stage was unique, and good for Assembly Hall. I'd seen the Steve Miller Band there and the venue is an echo chamber if the band happens to be set up at one end. The music seemed great to me. 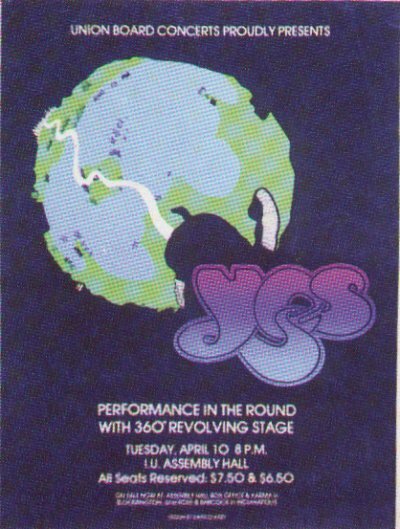 I've always loved Yes, but to be honest, on that particular night I think I would have enjoyed just about anything. This was my second concert...ever. The first being 'Relayer' in Indy. On the drive down from Indy the car was constantly being filled with 'smoke'...at one point it got so thick I thought I was floating in a cloud instead of riding in a car! The show, as I remember, was breathtaking (or could it be from the 'smoke' in the car?) I think I remember Chris being handed a left-handed cigarette while he sat on the edge of the revolving stage during Steve's acoustic solo wizardry!! He went around once and handed it off...cool! Steve received a stadnig ovation, and his voiced cracked from emotion when he said "Thanks alot, I really love playing for you." Again, thanks to my brother Dave, I am still a diehard Yes fan! front row of the main level , about eye level to the band on the round stage , and about 30 feet away from the stage. During Rick's solo , he picks up the guitar-shaped keyboard and moves to the center of the raised center of the stage the lights over his head flash like a huge lightning bolt accompianied by a loud thunderclap not once , but twice.